The settings page will then be displayed. Scroll down to see a description of each setting. Here on the settings page, you can update all of Registry Valet's settings. Each setting is listed along with its value. To change a value, click in the value field next to the setting you wish to change. When you are done making changes, click the "Update Settings" button located at the bottom of the page. The Background Color field affects the look of the registry page background. This setting uses internet hexadecimal color values. If you decide to use a background wallpaper, the color setting will be ignored. The Logo Alignment field allows you to select either left alignment or center alignment. NOTE: If you are using a custom HTML header, your company logo will not be displayed independently. Of course, it is a good idea to include your company logo in a custom HTML header. Click the dropdown box arrow to make a selection. The Page Alignment field allows you to select either left alignment or center alignment for your registry pages. This means that the page content will be either aligned to the far left of the browser window or aligned in the center of the browser window. Click the dropdown box arrow to make a selection. The Page Width field allows you to define the width of the content section of your site's registry pages. 750 is a good starting point, but you may make your registry pages (such as the registry signup form page) whatever width you like. The page content will be surrounded by the background color you selected above. If you choose to have a background wallpaper, your page content will be surrounded by the wallpaper. If you choose to align the page content to the left, then the wallpaper will be displayed to the right and below the page content. In the registry list (both the one that the bride works with and the one that friends and family view) the size of the item image thumbnail is controlled by entering a height in pixels into the Thumbnail Height field. The width of the thumbnail image will be proportional to the height based upon its actual size. If you wish to display a custom HTML header, select "yes" for the "Show Custom Header" field and enter the full URL (beginning with http://) into the "Custom HTML Header URL" field (below). If you selected "Yes" above, enter the full URL to the HTML header on your server. It should start with "http://". Similarly, if you wish to display a custom HTML footer, select "yes" for the "Show Custom Footer" field and enter the full URL (beginning with http://) in the the "Custom HTML Footer URL" field (below). If you selected "Yes" above, enter the full URL to the HTML footer on your server. It should start with "http://". If you are using Agenne View or one of our product Suites, the default URL for brides clicking the "Add additional products to my list" link is the catalog home defined in the catalog. If you wish to send the bride to another URL, enter it into the Catalog Home URL field. If you are using Registry Valet as a standalone application, you must enter the Catalog Home URL so that when the bride clicks "Add additional items to my list" link in the "Manage Registry Menu". If there is no URL entered into this field, an alert message will popup when this link is clicked. Enter the email address that you wish registrants to see as the return address on all emails they receive from the Registry Valet system (such as the signup confirmation when they create a registry) into the "Confirmation Email Return Address" field. When a new registry is created, you will receive an alert email. To specify the email address to which you would like Registry Valet to send you this alert, enter it into the "Incoming Alert Email Address" field. 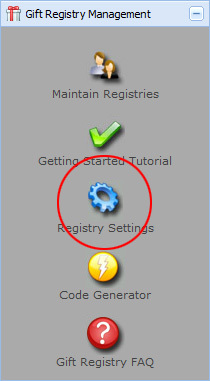 The Add to Registry Button Label has two functions. First, it sets the default button label text in the code generator so that if you, for example, want your Add to Registry Buttons to read "Add to My Gift Registry", you won't have to retype it each time to generate an Add to Registry form. Second, if you are using GiftSuite, it sets the button label on the Add to Registry buttons on your catalog's product pages. Registry Valet allows you to preset what types of registries can be created. There are two types of registries: Event-Based Registry (such as a wedding, anniversary, etc.) or an ongoing wish list. You can set this so that your customers can create one type or both. Your choices are: "Both dated registries and wish lists", "Dated Registries Only", and "Wish lists only". NOTE: This feature should not be confused with the Event List. 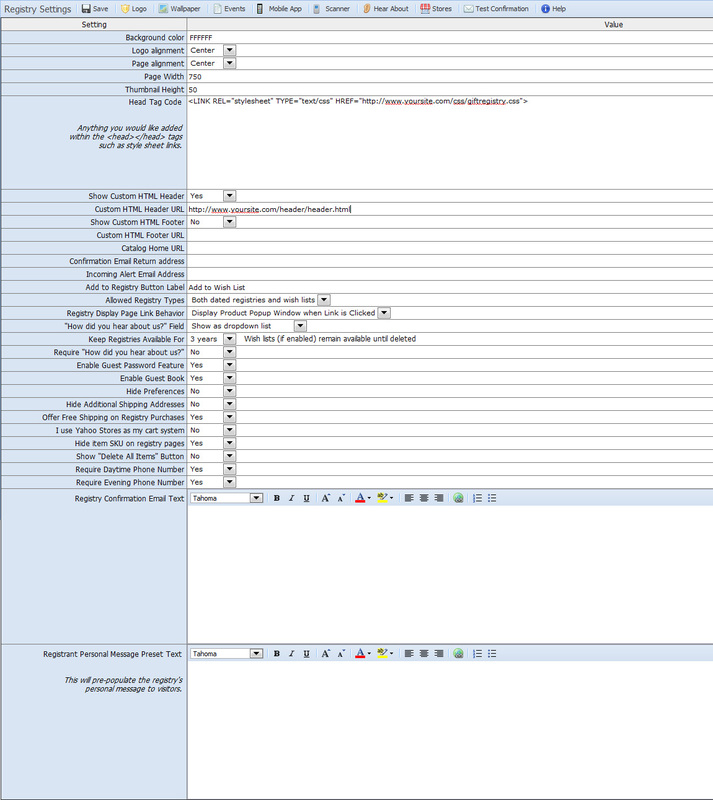 The Event List allows you to specify the types of events that a dated registry may pertain to. The event list is maintained by clicking the "Event List" icon in the menu. If you are only allowing ongoing wish lists, then the event list is not applicable. See "Event List Icon" below for more information. The "How did you hear about us field appears on the "New Registry" form. There are 3 choices for the "How did you hear about us?" field. The first option is "Do not show" which will prevent the field from appearing on the form. The second option is "Show as free-form text field". This option will allow the registrant to type whatever they want into the field. The third option is "Show as dropdown list". This option uses the list of options that you have specified. The default list of options can be edited and sorted as you see fit. See the "How did you hear about us" icon reference below. Registry Valet will maintain registries for a specific number of years according to what you select in this field. You may select between 1 and 5 years. After this period of time, the registrant will no longer be able to access their registry. Require "How did you hear about us"
If this feature is set to Yes, the "How did you hear about us?" field will be a required entry. Note that this setting has no effect if the "How did you hear about us?" field is hidden. Most registrants want to secure their private information such as names and addresses from unauthorized viewing. Registry Valet provides a guest password feature which allows each registrant to create a private password to give to their friends and family. The system makes sure that the password contains both letters and numbers to increase the strength of the security. Although this feature is available, it is not required, so each registrant can decide on their own if they wish to create this guest password. To enable this feature, select "yes" for the Enable Guest Password feature. If this feature is set to Yes, the Guest Book will be available to registrants. Visitors to their registries will be able to leave a message on the guest book for the registrant. Within the registry system are a set of preferences that the registrant can set. These preferences can optionally appear on the registry "New Registry" form. If this option is set to Yes, the preferences will be shown on the signup form. They will still be available when the registrant signs in to their registry and will be set to default vaules until changed by the registrant. The main "New Registry" form contains 2 additional addresses which are used for shipping items to registrants for Event-Based registries only. One address is for shipping prior to the event and the other is for shipping after the event. If you do not feel that your customers need these additional addresses or you want to keep the size of the New Registry form to a minimum, you may hide these addresses and they will not be used. To hide these addresses, select "yes" for this field. By setting this feature to Yes, your customers will not be charged shipping on purchases made from gift registries. This feature only works if you are using the Agenne commerce platform including CustomCart. If you are using another commerce system, please contact our support team for assistance. If you use Yahoo Stores as your cart system, you must set this option to Yes. Doing so will suppress the additional fields that Registry Valet passes to the cart. If this option is set to No, your customers will be unable to checkout. If you are interested in moving away from Yahoo Stores, take a look at CustomCart! By default, the item SKU is shown on the registry display page (where shoppers view the list of items). If you do not want the SKU to be visible, set this option to No. When a registrant is working with their registry on the worksheet, you can optionally include a "Delete All Items" button at the bottom of the list. Of course, each item has a delete icon next to it, but for the convenience of registrants with very large lists, this button can be included on the page. Set this option to Yes to show the button. On the "New Registry" form, the daytime phone number can be a required entry by setting this option to Yes. On the "New Registry" form, the evening phone number can be a required entry by setting this option to Yes. Would you like to add some additional information to the confirmation email that is sent when someone signs up for a new registry? Just type your message into this block. You may also include any HTML code and graphics that you like. To include graphics, the HTML IMG tag's SRC attribute must contain the fully qualified URL starting with http://. The editor offers options for your selected font, bolding, italics, underlining, larger or smaller font, text highlighting, text alignment (left, center, right), the ability to insert links into the text, numbered bullet points and non-numbered bullet points. If you want to give your registrants some ideas about the custom text message that they can display at the top of their registry (or wish list) display page, you can enter that here using the same features as the Registry Confirmation Email Text editor above. When you make changes to the gift registry software settings, click "Save" to save your changes. To change or upload your company logo to the Registry Valet system, click the "Company Logo" button. NOTE: If you are using a custom HTML header, you do not need to upload a logo. If you do upload a logo and then setup a custom HTML header, the header will replace the logo. To upload or change the background wallpaper that will be displayed in the Registry Valet system, click the "Registry Wallpaper" button. Selecting a background wallpaper will override a background color that you may have specified in the settings form. To update the list of event types for which someone may register (whilte creating a registry), click the "Events" button. To configure the Agenne barcode scanner including uploading sign-in page wallpaper, setting the background color (not visible on all app pages), and setting the default scan mode, click the Scanner button. Set up the list of choices for the "How did you hear about us?" dropdown list (if you selected the list option). If you choose the free-form text field option, the list of options is ignored. If your business operates more than one brick and mortar store location, you can optionally include these store locations in the New Registry form (as well as the preferences in the registry). The customer will then have the opportunity to associate their registry with a specific store location for more personalized tracking of your customers' registries. Click this icon to visit the Store Locations page. DO NOT USE THIS OPTION IF YOU HAVE ONLY ONE STORE. Use this option to send yourself a test copy of the Registry Confirmation Email. This allows you to easily customize the mailing without having to create gift registries or wish lists. Click the Help button to get additional information about the settings.